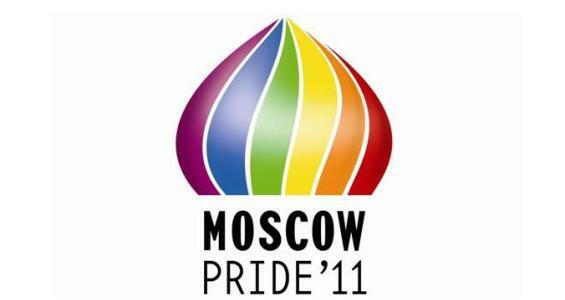 The May 28 Moscow Pride event - banned by the city authorities on May 17 - did not go smoothly: according to news reports, at least 18 gay rights activists and 14 of their opponents were detained by the police, at the Tomb of the Unknown Soldier on Manezhnaya Square and, later, in front of the Mayor's Office on Tverskaya Street. This was the sixth attempt to hold a gay pride parade in Russia's capital; a 2006 GV translation about the first attempt is here. LJ users zyalt [ru], drugoi [ru], o_maksimoff [ru], al_31f [ru], edelveis8 [ru] and linuel_foto [ru] were among those who posted photo reports of the rally and the clashes on their blogs. Okay, the majority of foreign [homos] have been detained at [Manezh Square]. [A black one] is still running somewhere. They're here now. I'm running off to do some work. Yelena Kostyuchenko (LJ user mirrov_breath), a 23-year-old Novaya Gazeta journalist who, among other things, has written extensively [ru] about the Khimki Forest case (GV coverage is here), explained on her blog why she was planning to attend this year's Gay Pride event in Moscow. The post [ru] has generated 7,414 comments so far (it has also been re-published [ru] by Novaya Gazeta, where there are two pages of comments now). 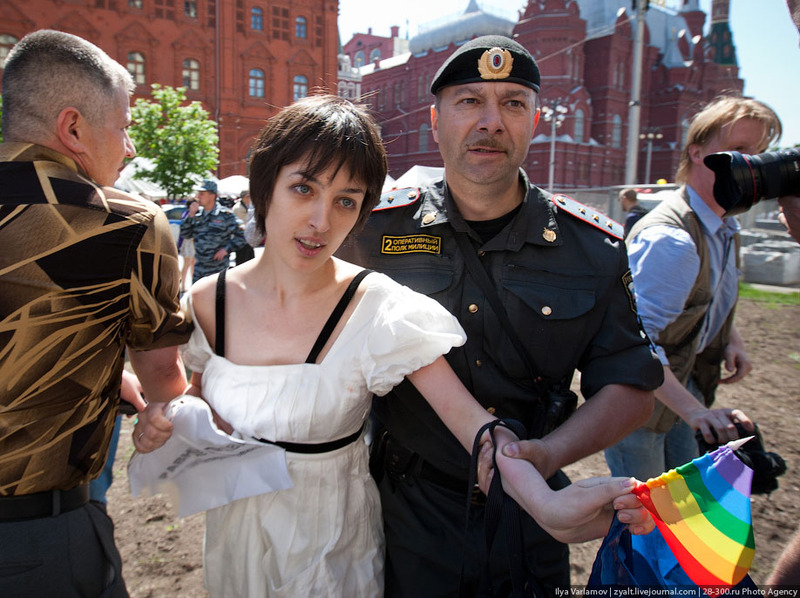 Kostyuchenko - pictured here, by LJ user o_maksimoff, with a printed note that reads, "It's boring to hate :)", and here, by LJ user zyalt, as she was being taken away by a police officer - reportedly suffered a concussion [ru] after someone had hit her in the temple during the rally, and is now at the hospital. Here is a translation of excerpts from Kostyuchenko's powerful post, in which she writes about her 31-year-old partner, describes problems that homosexual couples are facing in Russia, and responds, in advance, to the homophobic readers of her blog, recounting some of the obvious truths, which may not seem all that obvious to many. [...] We've been together for two years. [...] Moved in together after two weeks. I haven't regretted it for a minute. I'd like to spend my whole life with her. It is this very ordinary kind of happiness. I don't think it's much different from yours. We'd like to register our relationship. [...] We are adult, capable [women], citizens of the Russian Federation, we work a lot and well, we pay taxes, do not violate laws and love each other - we would like to register our union. We'd like the state to recognize us as relatives. Not just relatives, but spouses, with all that it involves. We'd like to be able to take a family mortgage. To get a family medical insurance [...]. I'd like my woman to feel secure in property lawsuits that may follow after my death. I'd like her to have an opportunity not to testify against me in court. And if I find myself at ER one day (which is, unfortunately, quite possible with my health), I'd like her to make decisions. We will have children. You, my dear homophobes, may [defecate yourselves] right now on the other side of the computer screens, but we will have children. And we already love them and look forward to their arrival very much. And, if necessary, we'll [do anything] to make them happy. And yes, we do want to have both of us listed in our children's birth certificates. We want - both of us! - to represent our children's interests at school, at the doctor's office, and (God forbid!) at the hospital and in court. [...] WE DEMAND GUARANTEES that, in case of the biological mother's death, our children will not be sent to an orphanage, while the second mother is trying to prove to the [damn] Russian custody authorities that she is related to these children. Everything written above relates to your question as to "why do they need parades if the Criminal Code article [criminalizing male homosexuality] is no longer there?" and "screw quietly in the corner and no one will touch you." I'm sorry, but we want a little bit more than this safe "screwing in the corner." We want a normal human life. Scary, isn't it? Some of the people I consider friends say: "you are right, but in this country..." And then follows a lengthy message about national culture, religion, social mores, etc., with a hint on emigration at the end. And I don't remind them of the fact that "this country"'s traditions included slavery and mass executions just a short time ago, and national culture and religion, as well as social mores, tolerated it well enough. I don't remind them because I believe that our country deserves something better. [...] Russia will change. It is changing already. And it will happen even if you, bastards, smash my head with a baseball bat [at the Gay Pride event later today]. Because love and common sense always - even though not at once - defeat hatred and [nonsense].